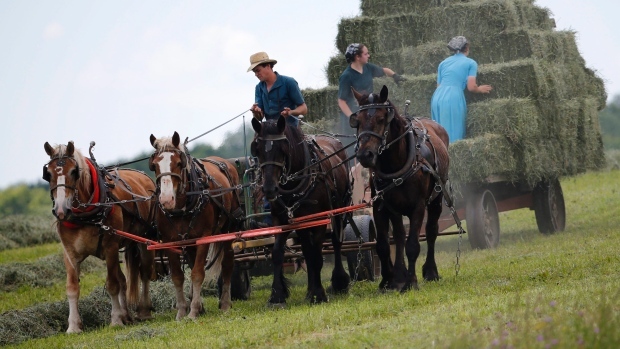 Amish families leave pricey Ontario farms, move to P.E.I. MONTAGUE, P.E.I. -- Much like the past when pioneer families travelled west for farmland to call their own, two groups of Amish families from Ontario are heading east to till the fertile, red soil of Prince Edward Island and establish a new home. According to realtor Brad Oliver, it has simply gotten too expensive in Ontario for the Amish communities to expand, and young people to own their own farms. "They are sitting on farmland in Ontario that's worth in excess of $20,000 an acre. That's fine when you own it, but the young generations are looking to buy farms and it just doesn't work for them," he said in an interview from Montague, P.E.I. "We're two to three thousand dollars an acre for good, productive farmland which will grow basically the same crop that they're used to growing in Ontario, and we've got the big, old farm homes that they like," he said. Amish are groups of traditionalist Christian church fellowships. They are known for simple living, plain dress, and a reluctance to adopt modern technology. Tony Wallbank, who ran a horse-drawn farm equipment company in Ontario, began the search for new land for the Amish a few years ago -- exploring properties in Northern Ontario and various locations in the United States. Each time the land was either too expensive or unsuitable. But during a trip in 2014 to Prince Edward Island, Wallbank found rolling fields and landowners anxious to see their properties farmed by traditional methods rather than sitting idle or becoming acreage for large commercial farming operations. Wallbank said the Amish who will move to the Island this spring are coming from two communities near Woodstock and Kitchener-Waterloo, with six to eight families coming from each community. "They like to have a core group of people, six to eight families, with a bishop and a minister and school teacher, because they have very strong community beliefs," he said. Wallbank said wherever the Amish settle, they are good for the local economy, especially for tourism. "Their culture is so popular, their dress, the horse and buggies, draft horses in the fields, and they also sell goods and vegetables on the roadside stands," he said. He said they won't be any drain on the economy. "They look after their grandparents and parents until they pass away right on the farm, and they don't have any unemployment, so they don't use employment insurance, nor do they go on welfare," he said. Wallbank has made a number of trips to P.E.I. with groups of Amish to show them the Island and to look at farms in the eastern end of the province near Malpeque. Oliver said six farms have been sold, while four others are under contract, and the search continues for more. "I think we're going to have a substantial population over the next decade," he said. "They're large families. These are people that have 10-12 kids and they branch out into the neighbouring farms as the generations continue. They like what they see here," Oliver said. He said the Amish families lead simple lives without modern conveniences such as electricity, and most do not use indoor plumbing. Oliver said an agreement has been reached with the provincial government to allow the Amish to do a form of home-schooling with an old-fashioned, one-room school house. Some of the settlers will arrive in P.E.I. in March while others will wait until the school year ends in late June. "This late May in eastern P.E.I. you are going to be able to see guys cropping the land with horse-drawn farm equipment," Oliver said. He said he's been searching the Island for horse-drawn equipment, and has been able to find quite a bit of it. Wallbank said some of the families will bring some of their existing equipment and horses from Ontario. "One young couple that are newlyweds -- about a month into their marriage -- have no equipment at all, so they are starting from scratch," he said. Wallbank said the Amish settlers have already been made to feel welcome. "Everybody from the premier of the province, down to the old fellas at Tim Hortons, have all welcomed the Amish when they visited," he said.